Here's what I've come across so far today. #1 The Alliance image needs to be centered. The image must have a maximum width and height allowed. if you can store a maximum of 50k of metal, and you have 150k of that resource in the planet it should show 300%. I think it would be space-wise to have a layout of 3 columns per row instead of 2 as in the picture above, it would mean less scrolling and faster gaming. The post was edited 7 times, last by carter15 ( Feb 27th 2018, 2:34pm ). The post was edited 1 time, last by carter15 ( Feb 27th 2018, 4:02am ). 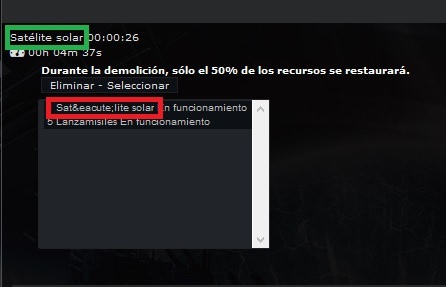 Editing the "TECH.php" file on line 129 fixed it: from "Satélite solar" to "Satélite solar" but I don't know if this will cause any trouble. #2 Small details are important too, aren't they? 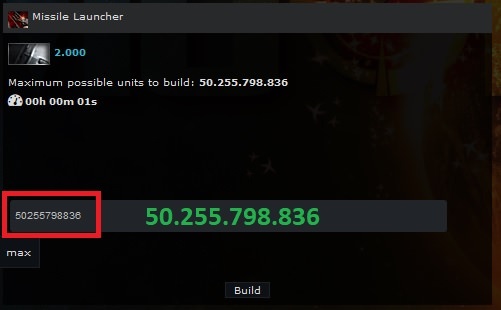 I think that the numbers in the build box should be shown as in the numbers in green. You may want to build 10k of solar satelites but you may end up building 100k . The same happens when selecting ship for a mission. #3 I think it would be nice to have an online users counter & total accounts on the 2moons main page. #5 As you see in the pic below, the "max" button is in a weird position. Also, when you click on max or when you enter the amount of ships, it would be nice to see how much time these ships will take to be built. As you see in the pic, 35 Star Fighter would take at 19s each is a total of 665 seconds = ~11 minutes. 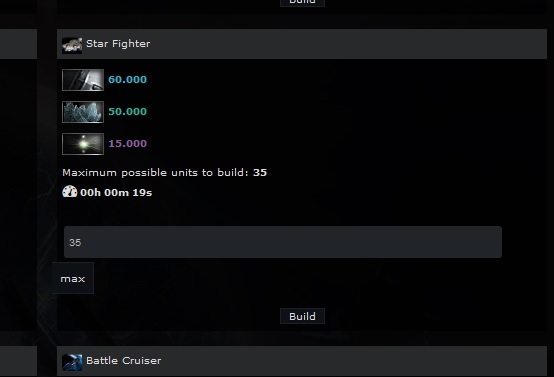 It would be nice to see the total time next to the amount of time that each ship takes to be built. #6 An option to relocate your planets using Dark Matter would be nice too! The post was edited 7 times, last by carter15 ( Feb 28th 2018, 2:02am ). 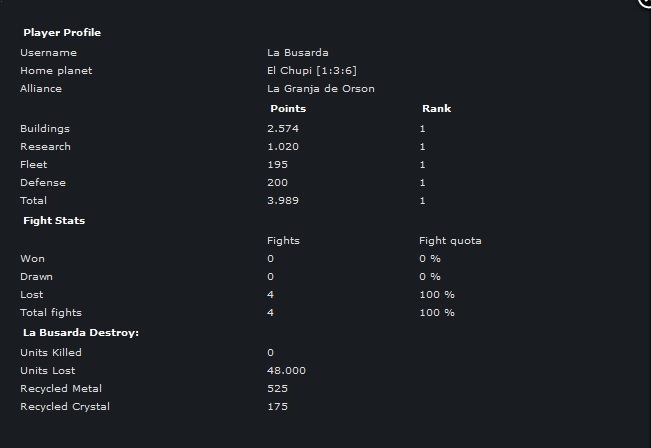 In the INGAME.php file of the Spanish lang there is a "%s" more than what it should at lines 964,965,966. #2 Related to the previous one, we realize that there is no alert when you're being attacked. You can only realize that if you happen to click on Overview. #3 It would be nice if the player profile showed how much Metal, Cristal, and Deuterium the player has looted in total. #5 The Battle Hall in the main webpage are shown but not the battle reports. 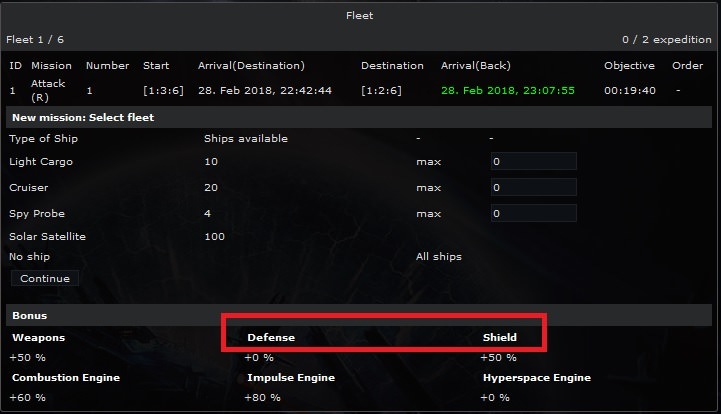 #6 In the fleet section, Defense is actually Shield Technology, and Shield is Armour Technology. To fix it, edit the INGAME.php at lines 338,339,340 modify them to look like this. The post was edited 1 time, last by carter15 ( Mar 1st 2018, 2:55am ). en en adjunto que subi con la traducción al español estaban corregidos todo esos errores que estas mostrando saludos, para el lenguaje en español. 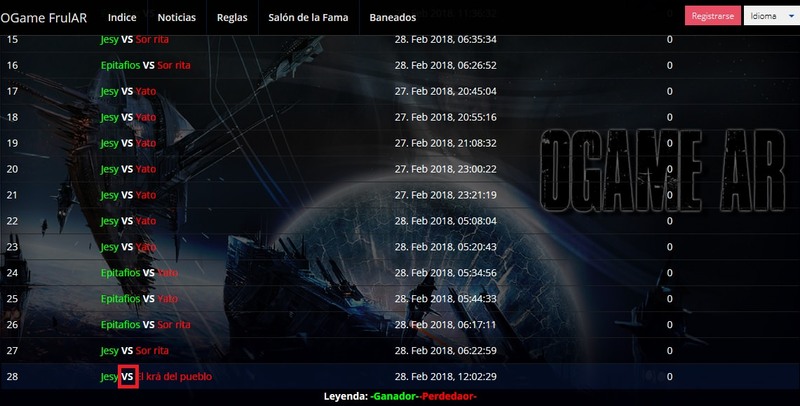 Estaría bueno que lo subas aquí asi @Danter14 lo puede incorporar a la nueva versión. Creo que sería mucho más práctico. The post was edited 2 times, last by yamilrh ( Mar 6th 2018, 2:46pm ). Кто мешает добавить к примеру три поля в стили? - это не трудно хоть 6 можно! не ужели многим так лень сменить ряд параметров..
В стилях Дантер проделал огромную работу и мне очень нравится то что он стили сделал чистыми на которые можно наложить что угодно не разгребая тоны не нужного , а добавить три колонки поменяйте процент ширины блоков они сами встанут как надо поменять надо в двух местах указать ширину в процентах ..